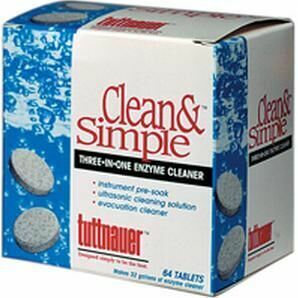 Clean & Simple is an ultrasonic / enzymatic solution dispensed in a unique tablet form. Drop 2 tablets into your ultrasonic tank already filled with tap water and the tablets will dissolve in about a minute. This is a non-ionic solution which is non-corrosive, non-toxic, biodegradable and non-caustic. FEATURES: • Easy to use tablet form. • Eliminates handling of heavy 1 gallon containers. • No bulky storage. • No pre-mixing required. • Enzymatic solution effectively breaks down protein.